How to make enjoyable educational games? For my masters thesis, I tackled the problem of educational games. Why are educational games a problem? Because the mass image of them is simply “quiz+rewards” – what has been referred to as “chocolate coated broccoli”. This analogy is particularly touching to me, because even though I like broccoli normally, the idea of coating it with chocolate repulses me. Similarly, the idea of smothering learning with patronizing encouragement and “rewards” makes the joy of learning less palatable. 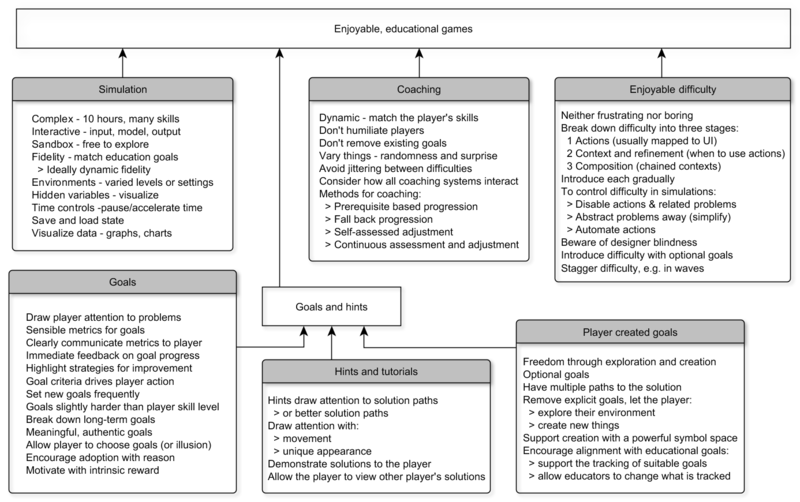 In my thesis, I try to put into words some principles for producing games for learning, games that are enjoyable yet impart knowledge that is valued in the real world. Roughly, this ends up with me suggesting that games should be built by simulating a subject area, tightly coupled with structures to support both game driven and free playing experiences. In detail, I provide a list of stuff you can do to up your educational game, with a wide range of examples from mainstream games that you’ve no doubt heard of, and likely have played – summarized in the graphic below. Whether you’re curious or horrified, I encourage you to read the full thesis! I hope that it sparks topics for discussion, and leads to more awesome games with a serious experience at heart. Previous Post Quiet YouTube when steam “donks”?